Enjoy a unique and exhilarating way to experience the beauty of the World Heritage listed Daintree Rainforest by soaring through the trees on flying fox ziplines. This full day tour is a fun, educational, fully guided, all weather activity where your feet don’t touch the ground. 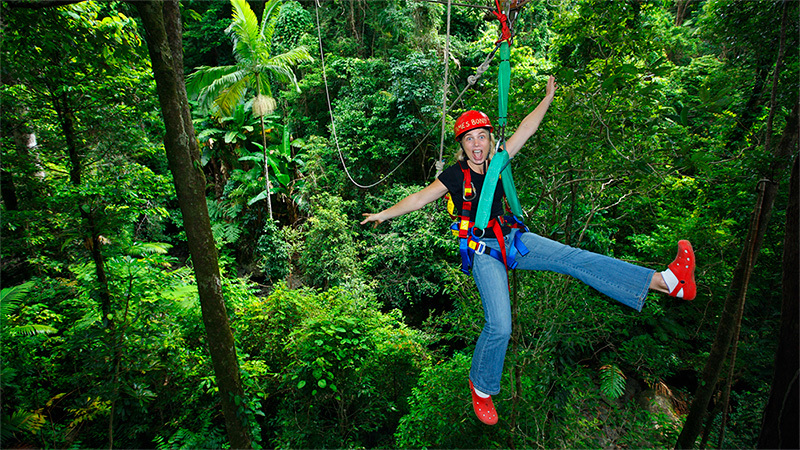 This day tour will see you flying through the wondrous Daintree Rainforest on flying fox ziplines and enjoying spectacular views from the five purpose built platforms. Joined by highly trained teams of scientists, tour guides and abseiling specialists, you’ll be led safely through the canopy and into a treetop world. Along the way they’ll even share some fascinating insight into our World Heritage Listed rainforest. Throughout the day you will also enjoy a guided tour of The Wildlife Habitat where you will see the endangered Cassowary and have the opportunity to have your photo taken holding a koala, snake or crocodile (extra cost). You’ll also be taken on a river cruise on the mighty Daintree River, where your guide will help you spot crocodiles, birds and other wildlife as you journey through the mangroves. Photo with koala, snake or crocodile (extra cost). Pick up and drop off is available from your Cairns accommodation and must be organised directly with the supplier.